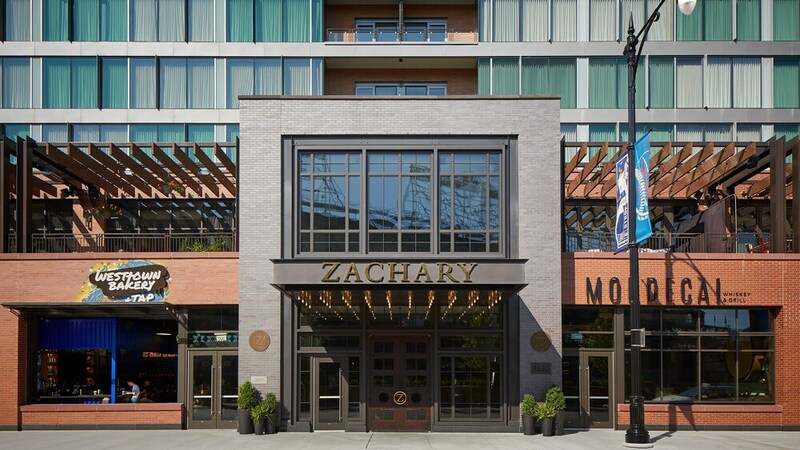 Located in Wrigleyville, Hotel Zachary Chicago, a Tribute Portfolio Hotel is adjacent to Wrigley Field and within a 15-minute walk of popular sights like Vic Theatre. This 173-room, 4-star hotel has a restaurant, free in-room WiFi, and a fitness center. This hotel is home to a restaurant and a bar/lounge. Satisfy your hunger from the comfort of your room with room service. For your convenience, a cooked-to-order breakfast is served for a fee each morning from 6:30 AM to 11 AM. Guests can expect to find free WiFi and 55-inch an LED TV with cable channels. The bathroom offers hair dryers, designer toiletries, and bathrobes. Other standard amenities include free local calls, free bottled water, and a safe. Guests of Hotel Zachary Chicago, a Tribute Portfolio Hotel enjoy features like a fitness center, free WiFi in public areas, and free newspapers. Valet parking is available for USD 75.00 per night. The front desk is staffed 24/7 to help with luggage storage, and answer any questions about the accommodations. This smoke-free hotel also has a porter/bellhop. The hotel offers a restaurant. A bar/lounge is on site where guests can unwind with a drink. Wireless Internet access is complimentary. This business-friendly hotel also offers a fitness center, complimentary newspapers in the lobby, and room service (during limited hours). Onsite parking is available (surcharge). Hotel Zachary Chicago, a Tribute Portfolio Hotel is a smoke-free property. Hotel Zachary Chicago, a Tribute Portfolio Hotel offers 173 air-conditioned accommodations with safes and complimentary bottled water. 55-inch LED televisions come with cable channels. Bathrooms include bathtubs or showers, bathrobes, designer toiletries, and hair dryers. This Chicago hotel provides complimentary wireless Internet access. Business-friendly amenities include desks and phones; free local calls are provided (restrictions may apply). Housekeeping is provided daily. Bar at Hotel Zachary - This restaurant serves breakfast and light fare. Guests can enjoy drinks at the bar. Open daily. Alma Room - This restaurant specializes in American cuisine and serves breakfast only. Open daily. Start your morning with a cooked-to-order breakfast, available each day from 6:30 AM to 11 AM for a surcharge. Room service is available during limited hours.